Click the EVW link at the top left of this page to find where we game. Wargaming the Age of Marlborough - Warfare in the Age of Reason, when men dressed in pink, wore wigs and fought like lions. Blenheim 2004 gaming the 300th year anniversary of the Battle of Blenheim and our WSS campaign game. Advertising helps keep Warflag free for users. These were your thoughts on the Wargame Supplier banner ads at the top of the pages? When asked if the banners bothered you, 93% either were not bothered by them or liked them. This was the voting poll (not the flag pole) which asked which flags were preferred by viewers. he poll asked "which style of flag do you prefer", either the textured of the plain style. I was a little surprised at the result. Many viewers have asked in the past for plain flags because they are easier to modify (something we encourage). However, in the four months this pole ran, we received 3,247 individual votes. The result were 64% in favor of the textured flag style. Without their contribution, and that of the artists, Warflag would be a mere shadow of itself. I've uploaded some of the photos from the Blenheim 2004 game played at Enfilade gaming convention last may (2004) in Washington. Most of the battalions and regiments in this game are flagged with paper flags from this site. This is a nice shot or two of 3,600 wargame figures on a 36' table. Alex Pil has contributed some beautiful textured flags from medieval Europe. 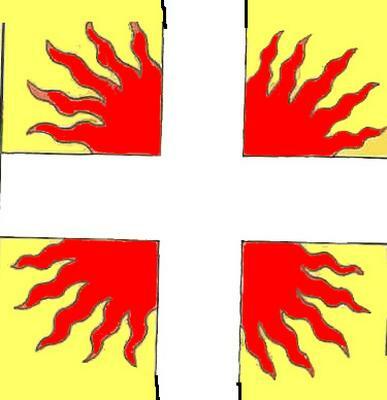 I have just uploaded his Medieval Belgian flags into the appropriate section. Don't go just by the low quality image used on this page - which is just a sample - but be sure and check them out in higher resolution under the medieval section. Time for some updates: I've been working on my own Franco Prussian War 15mm figures and have decided to correct some flags I had uploaded for this war. I had originally used the flag given in the Terence Wise book - Military Flags of the World. I was subsequently told that these were in fact inaccurate and I have therefore started to put a more correct version of the flags online. The 1st Corps has been corrected and the rest will follow. A set of beautifully drawn hand painted flags from Dietmar Reddig in Hanover. Dietmar has created all the foot regiment's flags from 1759 - but many of which can be used throughout the 18th century. Dietmar has access to local museums and libraries which has helped in his research. Hopefully we will see more flags from Dietmar in the future. They can be found in the Seven Years War section by navigating the "The Flags" link in the upper right. Advertising Banner Poll - see results to the left. It's time for me to consider what it costs to run Warflag as the annual dues come up. I'd be very interested to find out how you all feel about the banners at the top of the pages. Please take a moment to view the poll on the left had side (down a little) and vote. This is one of 190 hand painted French flags of the Wars of Louis XIV avaialble from the Warflag Yahoo groups. Join by clicking the links on the right hand side of this page. These were painted and painstakingly uploaded by Gilles Boué from Paris. Eventually we will get these downloaded and posted the main site - but for now, they can be found in the photos section of the Warflag Group. Someone on a news group asked about the WSS Bavarian Grenadier Cavalry squadron. 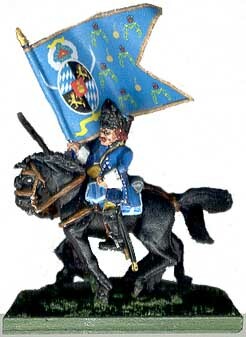 I happened to have recently made a flag for this and had uploaded it and another Bavarian Guard cavalry standard to the site. As I had made the flag, but to my knowledge, no one makes a figure for these in 25mm, I thought I'd explain how I converted a couple of Old Glory cavalry from their Wars of Marlborough line. I took the heads off of a couple of old Foundry Grenadiers. These are also OOP so you could use a grenadier from the same OG range, but the front of the bearskin is not quite right - it has a low cloth panel on the front. This can easily be filed off and the front blended into the bear fur with a bit if "green stuff". I haven't done a lot to the site in the last few months as I have been busy with my Blenheim Wargame project. However, that project required me to get the Hanoverian army done, so of course - I needed the flags. The first batch have been uploaded to the WSS section. Hungarian War of 1848 - now there's a war you don't see gamed often - but you can get the flags here. These are a contribution from billh512002 on the Yahoo Warflag Group. See the rest of them in the 19th Century European Wars Section. Uploaded Napoleonic French Infantry Fanions from Tinkerer_99 from the Yahoo Groups. These can be found in the Napoleonic section for those looking for a bit of variety in Flagging the French. 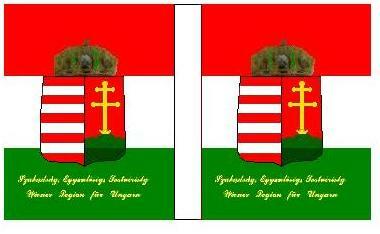 Also uploaded some Seven Years War Austrian flags from Chris Reynier. For those of you make armies for Blenheim of the War of Spanish Succession, you may wish to obtain the CD from Robert Hall. It is available through Dan Schorrs's fantastic website in the U.S. and also in from Peter Berry's site in the U.K. who also produces 6mm figures for this period. Also check out both of these sites for tremendous historical information and painting guides. This example is the regimental and colonel's color from the French Regiment Greder Allemand and is one of the flags on CD1. The CD is in a PDF format, so to make a flag, it is necessary to cut (ALT + PRINT SCREEN) and paste (CNTL + V) the image to windows paint, and cut out the unwanted part of the image, and make a mirror image. The CD provides all the colors for all the French regiments as well as all known uniform details from many sources, The CD is tremendous value at $50. 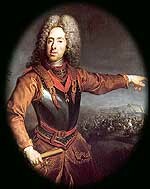 Uploaded the the first of "The Military History of Eugene of Savoy". This book from 1736 presents the history of Eugene and Marlborough, but for this web project, will just contain those pages on Eugene during the War of the Spanish Succession. The fist upload takes us from The Battle of Chiari to the Battle of Hochstet (Blenheim). I will add more pages in time. I don't know how popular this sort of project will be, so I would appreciate feedback if you enjoy this project. A series of hand painted flags from an anonymous donator who will only identify himself as 'Agent_X' who has been a wargamer for 23 years and has won many trophies for his figure painting all across the UK. His particular interest is the 16th to 18th Centuries , particularly the ECW and Italian Wars. 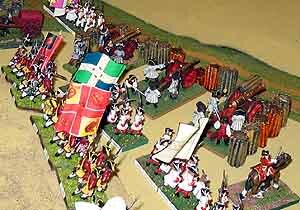 These are Later Italian Wars flags and can be found in the renaissance section of the website. They provide an interesting and very artistic alternative to the hard lines of the computer drawn flags. The Samurai section has been updated to the new format. These 65 Samurai banners and standards were created by Wayne Ko. They are presented as single sided images. They can easily be turned into banners or Shimonos as required by manipulating them in a simple graphics program, such as Microsoft Paint that comes with Windows. These flags' sources have been referenced by Wayne on the Samurai selection pages, as well as instructions for printing. The Pirates page has been updated to the new format. What with all the new 28 mm flags and Ships available, this should be an interesting period. For the big battle game, don't overlook larger actions involving mid or early 17th century figures against more regular troops stationed in the Caribbean. Of particular note are the early Spanish available from The London War Room. Medieval Burgundy. A splendid set of excellently drawn flags from Christopher Reynier has just been uploaded. This sample is a reduced thumbnail, so check out the directory for the full sized drapeaux in all its splendor. Christopher is from the Principality of Monaco, but lives now in Paris. He has taken the old Burgundian flags in the medieval section, transformed some and completely re-done the rest and added a few more. You can find the flags by selecting Burgundy from the Medieval section, and following the appropriate links. Warflag is free. You can help keep it that way with a small donation. Clicking on a button below will allow you to donate just $2.00 to help pay for Warflag. This site contains a flag library designed specifically for decorating wargame miniatures. There is no charge for them. The flags are historically accurate where I have found sufficient information and historically plausible where I have not. The Site should be viewed at 800 DPI or better with Netscape or Explorer set to 16 bit color. The flags are the result of several years work and grew as a result of producing flags for my own armies and for those of friends. There are also some significant contributions from viewers. Click to subscribe to Warflag discussion group. Be seen by thousands of Wargamers. Help support this free internet service, and wargaming and expose your business to new customers. All flag images are Copyright by Ian Croxall and noted artists 1994 - 2009 and may not be reproduced without permission. Flags may be reproduced for use of decorating your own military miniatures or for providing copies on a non-commercial basis to friends. To sell them, give them away with miniatures you sell as a business, print them for others and charge for your printing expenses or reproduce them on your own website is a breach of copyright.